This year has been an interesting year for me riding-wise. Not only have I discovered the joys of riding with proper mud tyres (Mud Xs since you ask), but I’ve achieved a personal goal which was to ride 100 miles off-road in one day (the South Downs Way). Oh and of course let’s not forget my ride on an MTB tandem (thanks Darren). But in amongst all that, I’ve also – finally – discovered the joys of tramping the tarmac with the purchase of a Specialized Sectuer Elite. Well, a change is as good as a rest they say, and road riding offers such a huge fitness-building contrast to mountain biking that I’ve found myself with an unseemly amount of enthusiasm for the darkside. What you learn quickly from road riding is that riding when it’s wet will get you colder, wetter and dirtier than anything you’ve ever experienced on a mountain bike. Which is where Crud Road Racer mudguards come in! A few weeks back I cracked. I couldn’t face the prospect of more road riding in the wet after a particularly damp week. So I contacted Pete @ Crud who very kindly obliged by sending me a set of the Road Racers for review. The Road Racers are something of a departure for Crud who built their name with simple, no-nonsense mudguards for off-roading. It’s a competitive area but they continue to be the benchmark in off-road mudguards, as well as innovating with the Moto-X inspired Fast Fender, which I’ve also tried and consider pretty much to be bullet-proof in stopping muck from being thrown in you face. One of the features of Crud has always been the fact they fit pretty much any frame. 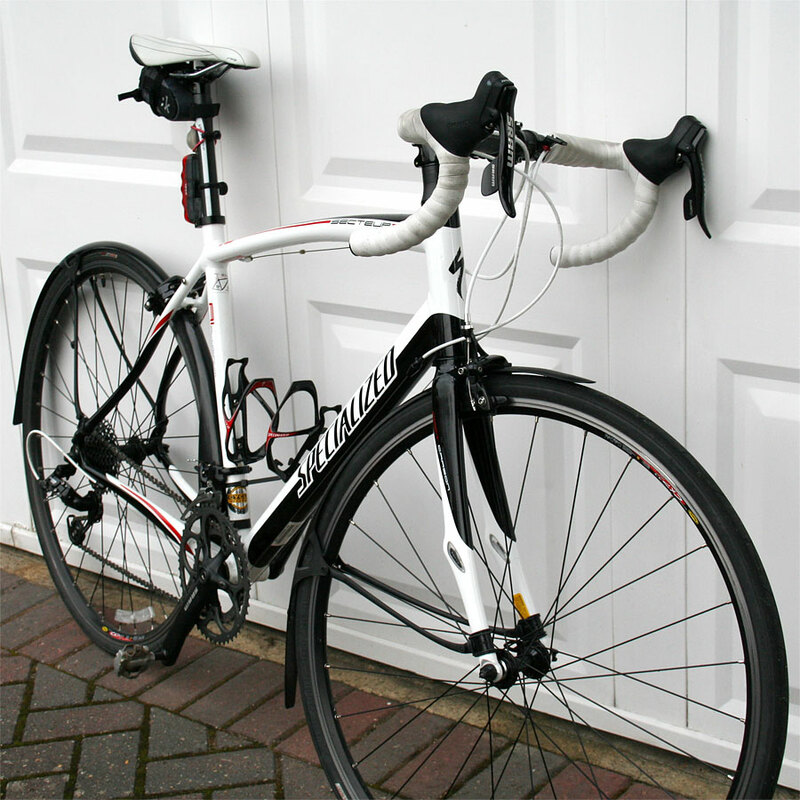 Road bikes on the other hand come with tight clearances and a need for rack/mudguard mounts which makes it very hard to achieve a one-size-fits all universal product. Somehow with the Road Racer though Crud have managed to get pretty darn close. So what are the details? 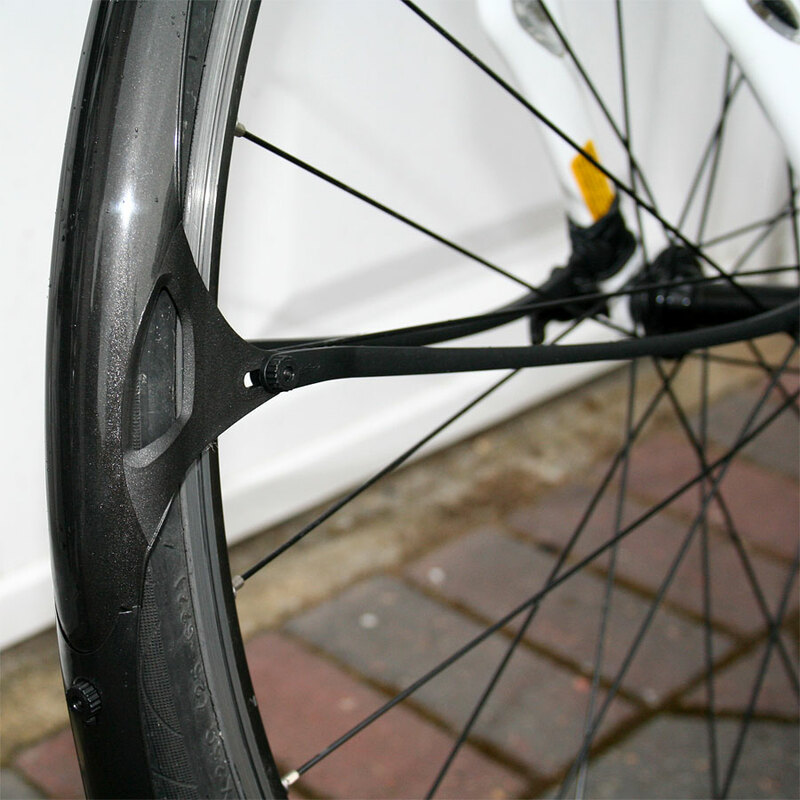 Well, the mudguards are made from the same tough, moulded plastic that is used on their MTB mudguards, but come in sections which you fit together. 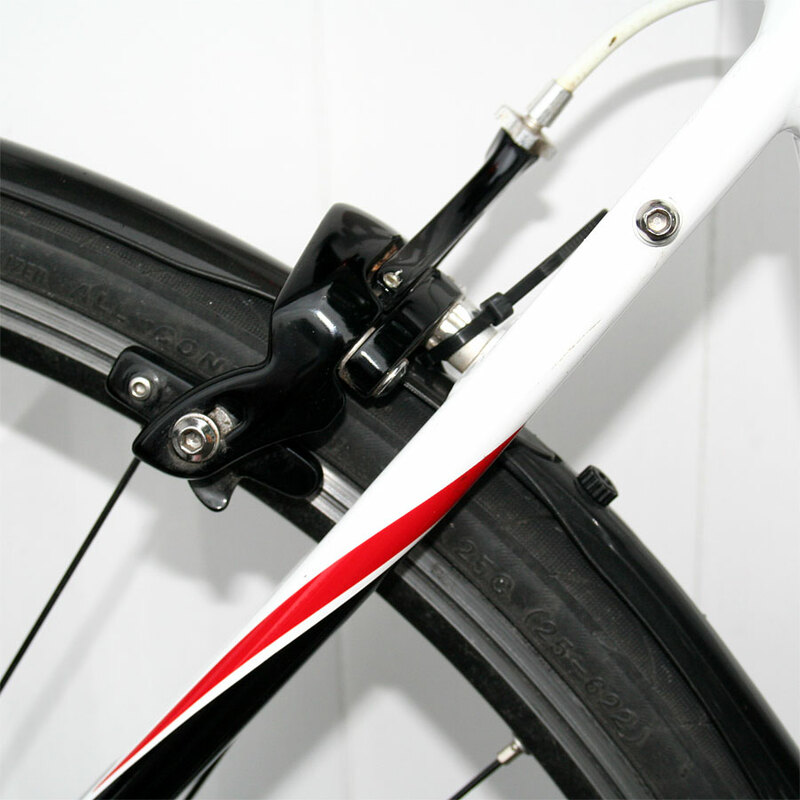 You get a pair of central mudguard sections which mount to the frame and brake boss, onto which you fix different length front and tail sections to fit your frame and tyre size. A quick look on Crud’s website throws up a video tutorial which is well worth watching before you start the assembly process and it’s worth knowing that having a hacksaw and some electrical insulating tape to hand is a smart move. The tape is to ensure the double O-ring secured mounts don’t scratch your paintwork, while the hacksaw is vital for making the lower rear drivetrain shield fit properly. It’s worth stating that DaveC co-incidentally bought himself a set of the Road Racer mudguards himself recently and while they seem to fit well, he was less than complimentary on the faff-nature of fitting them. It has to be remembered that despite Dave’s expertise in MTB fettling, road bikes are a whole other world of tight-tolerance tears!! Based on his comments I made sure I had a warm sunny afternoon and a bit of time available to fit my own! As it turned out, I found it very straight forward but I reckon broad daylight is an important element of this. Anything involving a dimly lit garage will cause you problems. I fitted the front guard first which involves fitting the fork mounts and then securing the centre mudguard section to both them and the brake boss before adding on the tail and front of the guard. The whole contraption is held on using plastic nuts on steel screws and these are designed to be done up to a secure finger-tight level, plus there’s a zip tie holding on the guard at the brake boss. Getting the mudguard into place is not too bad but there’s also a bit of fiddling to get the mudguard to sit in such a way that it doesn’t rub against the tyre. It’s not difficult, but a fiddle for the novice, but as the whole thing is quite movable (being plastic) you do eventually get the thing centred. After that you just need to add a couple of small nylon brushes. The nylon brushes are quite an interesting idea in that they sit on the mudguard and lightly rub the wheel rim. The aim is to both keep the mudguard centred and clean the rim of muck at the same time. After the front wheel, the back proved a touch more of a challenge as the clearance where it mattered (under the brake boss) seemed a bit tighter. Also, as the mudguard comes down toward the crankset it flares slightly to keep salt spray off the drivetrain but of course the distance from brake boss mount to bottom bracket will vary from bike to bike. I ended up wielding the hacksaw (as recommended by Crud) to trim this section slightly. Again, once centred you then add nylon brushes to the mudguard. All in all, it probably took about an hour to fit these and next time round I reckon I could do a lot quicker, but of course it depends on your bike and frame size. I have a 56cm Secteur but Dave has a 54cm Allez for example, so your mileage will vary. Smaller frames might need a fair bit of hackage. My initial impressions are very favourable and I’ll do another review after some proper wet winter running in a few months. So far, the bike hardly looks as though it has mudguards on, the mudguards are not rubbing and they’ve proved quite easy to fit so long as you have time on your side. If they keep me dry and my riding partners spray free then I’ll consider them a winner. On the looks and cost front they score heavily and having chased Barrie and his old style rattly mudguards most of last winter it’s good to say they seem nice and quiet too. More photos of the Crud Road Racer Mk2 fitted to my Secteur Elite can be seen on Flickr. The joys of mudguard fettling! I have deeply untrendy, stainless steel stayed SKS mudguards on my winter trainer. They need a frame with mudguard eyes to fit properly but when they are on, they are give amazingly good coverage and are rock solid, but you do need fair clearances. I had some of the Mk1 crud racer guards a few years ago and to be honest they weren’t the best in terms of fit (horrible shaky things) and coverage. I’m glad to see that MrCrud has upper his product performance and if I didn’t have old fashioned guards fitted to my winter bike, they would be on the top of my list. Read your review, Matt – ordered the guards! The mud guards are good, but the bolts that hold parts of the guards tend to drop off over time. Then it’s time to get the zip ties out. I have had a go at fitting to Amanda Madone 5.somethning with the guards. ok they might fit any road bike but, it’s going to be a cut & shut job on it. The Guards that is. “Remember your mudguards rattling” You aren’t kidding Barry. If you don’t buy some crud guards we’ll have a whip round to buy you some. Not that they were irritating or anything…..
tony i new my cunning plan would work, if i hung out long enough, i thought the guys might have a whip round for some new ones!! 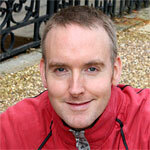 Mine are fitted to both Ribble and Viner road bikes and my first impressions are good. Worth pointing out that I believe the weak ‘bolts’ are to ensure they are first point of give if a stick or other object presents the risk of jamming a wheel. The hardest part about fitting them for me was understanding the instructions. IT’s the usual fun of head moving from parts in hand to diagram and back again and working out that you need to disassemble before you begin assembly. I reckon the first pair took me an hour or more and the second pair about ten minutes. Personally I chickened out of the chaingear guard and fitted one of the simpler extensions to the front of the rear mudguard i.e. between rear wheel and seattube, this was because the tolerance was too tight and I didn’t fancy the hacksaw approach for first fit. I may revisit this. I will be interested to see if the new full length tail extension that our MK2 Cruds have keep the spray off the riders behind.